So, so, soooo ready for the weekend. Working is terrible. No joke. I’ve been back at work for a week, and Elliot spent her first week at daycare. She is fine [her teachers are the sweetest things ever], but I have to schlep over to feed her at lunch since she won’t take a bottle [who even knew this problem could exist?!]. We have some fun things planned for the weekend – The Great Cloth Diaper Change at The Baby Grocery Store, donating milk at the birth center [not like we can give it to Elliot], and chillin’ like villains. Clearly I haven’t written a blog entry in a long time. I’ve been busy with Elliot [who is almost 11 weeks old! ], and I would rather spend time with her than hang around the interwebs. Anyway, this is a post by request. We have lots of friends who are preg or planning to have a baby in the foreseeable future. Having a baby means one thing : you need a lot of stuff. I hate lots of stuff. So, this is my take on what you really need for the first few months. Feel free to comment with additions or other recommendations. A co-sleeper. We have the Arm’s Reach original co-sleeper and really like it. Co-sleeping reduces the risk of SIDS and makes it easier to feed the baby during the night [read: you don’t have to get out of bed. #winning]. I’m also a big fan of the Arm’s Reach because it functions the same as a Pack ‘n Play, grows with the baby, and looks a hell of a lot better, in my opinion. Halo sleep sack swaddle. Probably 2. We really only use one, but it’s nice to have a spare in case one gets dirty. Having a winter baby, we use the fleece kind, which keeps Elliot warm in the co-sleeper without the worry of a blanket. We didn’t swaddle Elliot’s arms at first at the advice of the lactation consultant who led our breastfeeding class. The baby needs to be able to cue that she is hungry and wake up to eat. Something to consider… we do swaddle her now. Babies also eat… a lot. Luckily not much is required for this. I have a boppy, but don’t use it to feed Elliot. I also don’t use our glider. So, yeah, I don’t actually need anything for this one. I do like these Undercover Mama tank tops though. [Elliot will not use a bottle, so I have no recommendations on that front.] Oh, and I use a Hooter Hider nursing cover when we have guests or we are out of the house. Depending on personal preference that may not be necessary, but I haven’t really ventured into feeding Elliot without one in public even though it can get really hot under there. Cloud B Sleep Sheep Snug Rug. We used this a LOT when Elliot was tiny. She loves to lay on it, it isn’t ugly, and I can see her snuggling with it for a long time. It’s also super easy to carry around the house. I just lay it in the floor wherever I am. Burp clothes. 10 is probably a good number. We have 10 of the Gerber Newborn Gauze prefolded diapers plus 4 more that are monogrammed and cuter, but otherwise exactly the same. Make sure to get the gauze ones because they are supposedly more absorbent although I haven’t personally tested it. We try to always lay one under Elliot in case she spits up, but I have a spit up spot on the bed right now due to failure to follow my own advice. Mittens. Seriously one pair is probably fine and we don’t use these anymore. We did need them in the first few days – Elliot would constantly scratch herself. Now we cut her nails [or use a nail file], but I didn’t really feel like doing that in the first few days, so the mittens were a help. Clothes. 10 outfits is enough at any given time. I know people are going to say that babies need lots of clothes, however, it is rare that I change Elliot’s clothes more than once per day. Plus, I do laundry frequently. The complicated part of clothing is that it is impossible to predict the size of the baby before birth. We didn’t have many newborn outfits and most [though not all] of the 0-3 months stuff was too big at first. However, a few newborn outfits was enough because Elliot has outgrown those… plus she could make the 0-3 months things work after just a couple of weeks. The other factor here is that we didn’t use much clothing at first for skin to skin contact and to help the umbilical cord stump fall off. We put her in little kimono shirts, but we got them for free at the hospital [well, free aside from the $18,000 cost of my surgery]. I am a big fan of one piece outfits. I think they are easy and Elliot wears them to sleep as well… Dustin likes the baby gowns [because he changes diapers at night] but I kind of hate them because Elliot can’t go in the carseat, the swing, the bouncy seat, etc with one on. I say skip the gown if you are strapped for cash, but get a couple if not. Blankets. We basically use one and not even that often [mostly when we go out of the house]. We have several aden + anais that we like and may use more in summer, but right now we use this one from their cozy collection. We have gotten TONS of compliments on it because of the weight. Diapers and wipes. I could write a whole book on this. We use cloth diapers and cloth wipes. 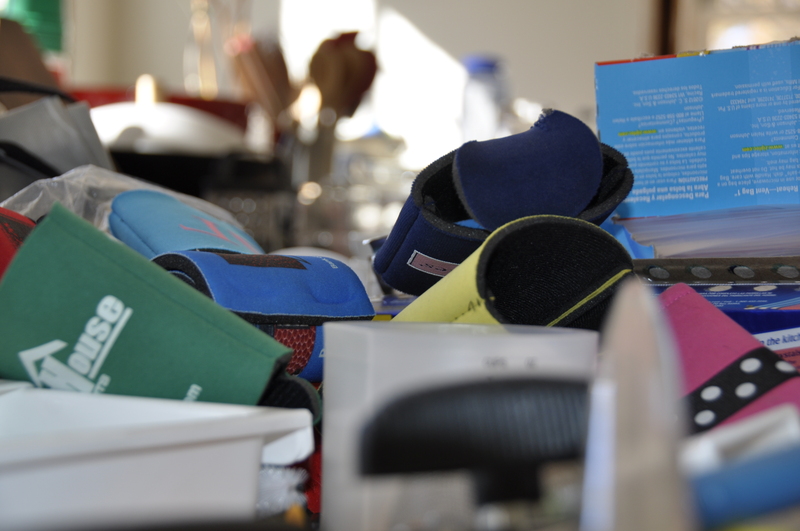 We LOVE BumGenius All in Ones – they don’t leak, they fit well, and there is no stuffing or maintenance for these [we use the snaps, not the velcro]. We just throw them right in the washer. We used some Charlie Banana newborns and they were terrible [they have a tag sewn in the back, which led to leaking]. We have Under the Nile wipes and a spray that we just spray right on Elliot. [I am going to start making spray – I just got a recipe, so we’ll see how that goes]. We used two packs of Seventh Generation disposables when Elliot was first born [meconium could stain the cloth diapers and she had to be 8 lbs to fit in the BumGenius]. Changing pad. We leave our changing pad in the bedroom and don’t have an official “changing table”. We just throw the changing pad right on the bed and it works great for us. We also have a changing pad for on the go [the Pronto by Skip Hop]… we keep some disposable wipes in it, and it’s been particularly great for changing Elliot in the car when there’s not another option. Wet bags. We use these to store the dirty diapers and wipes. We have two large and one medium, which we use when we are out of the house. I think this is the right number. We have really cute ones by SmittenBaby, which I can’t find for sale anymore. Maybe try Planet Wise? Hooded towel. Just get 2. Shampoo / body wash. We use Burt’s Bees. Wash clothes. Get a pack from Target or something. We only really need 2, but I think they come in a pack of 5 for cheap, so just go with it. Bath tub. We have the Puj and love it. I don’t care that we are going to need to get another baby bathtub eventually. It is so convenient right now… it works great and hangs flat on our refrigerator. A carseat and carrier. We have the Peg Perego Primo Viaggio SIP 30-30 in Pois Grey and love it. It snaps into our BOB stroller, which is necessary with whatever car seat you get. Definitely get an infant seat rather than a convertible. 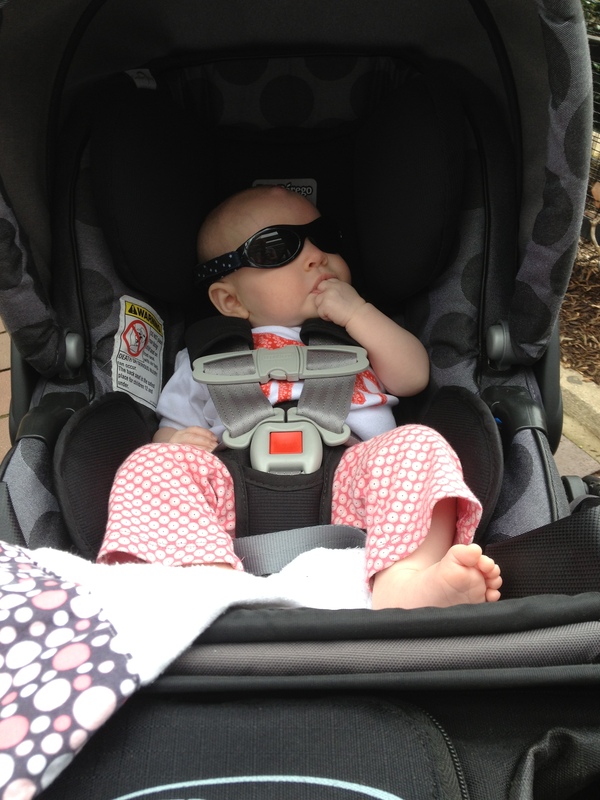 According to our midwife, the infant seat it MUCH safer. Plus you can’t carry the convertible seats, which is a must have feature, in my opinion. Stroller. We have the BOB Revolution SE. We wanted to have only one stroller… didn’t want a jogging stroller AND a mall stroller and an infant stroller and a bigger stroller… too much. The BOB is good for everything. Our car seat fits in (you also need this adapter). A diaper bag. We don’t really have a true diaper bag – I use a leather bag I got for my birthday and I love it. It works fine, and I don’t look ridiculous with some baby patterned bag. I think that’s really it in the way of must haves. There are a few things that we use to entertain Elliot… I don’t know that you need all of them, but it’s good to have a mix. We didn’t really use any of these for the first few weeks although we should have used the swing. Rattle. Doesn’t matter what kind – we have several. We have used a rattle with Elliot since she was tiny although now she is entertained by it more than she was at first. In the beginning it was good to help her hear noises and turn to face them, etc. I carry one in the diaper bag. Mirror. Elliot loves looking in the mirror, so I carry one in the diaper bag in case of emergency. Brightly colored links. Elliot loves colors and holding things that fit in her tiny hands. These are good for that. Plus I can shake them and she becomes fascinated. They stay in the diaper bag. Board books. She still doesn’t really care about books, but I occasionally read to her anyway. Play mat. I bought this Fisher-Price play mat used [it looks brand new] from Craigslist. The person I bought it from said her baby hated it. Elliot LOVES it. I highly recommend the used route on this one since it’s kind of impossible to predict the outcome… plus they are really ugly [ours is bright, awful colors but Elliot loves them, soooo ?]. This Fisher-Price mat has flashing lights the baby can look at… these make Elliot laugh and squeal, so definitely get that feature. She also likes looking in the mirror, so a mirror attachment is really handy. Swing. I also bought this Fisher-Price Lil’ Lamb Dream Swing used from Craigslist. Elliot never looks happy in it, but it usually makes her pretty content and sometimes she falls asleep in it even if she looks angry. She used to always fall asleep in it, so it works awesome for a short time. This particular swing has a mirror and mobile above it… Elliot only occasionally notices them, but when she does, she is fascinated. Bouncy seat. Skippy bought this one for Elliot recently… mostly as a kind of portable swing… it’s something easy to put her in that moves and makes her content without me dragging a gigantic swing around every room of our house [upstairs, downstairs, kitchen, bathroom, ugh]. Elliot hated it at first, but she is good with it now. It doesn’t really bounce on it’s own, which stinks… but it does vibrate, which typically is enough to make Elliot happy. Dustin and I discussed ditching the swing and the bouncy seat after Elliot and getting something fancy like this mamaRoo that supposedly bounces and sways for our next baby. I’m thinking it kind of combines the function of both the swing and the bouncy seat and is still relatively portable. Anyone try one? Elliot is two weeks old. I didn’t post much about our birth plan before E was born, even though it’s something we put a LOT of research and planning into [that’s probably a drastic understatement]… we decided to have a natural birth with the best midwife ever at Carolina Community Maternity Center in Fort Mill, SC. I’m writing about Elliot’s birth now for two reasons. 1. I don’t want to forget it. 2. To all of you jokers who said I would be begging for drugs, BOOM. As of the Friday before Elliot was born, I was pretty sure we were having a baby over the weekend. I didn’t feel well and was having random contractions. But, I really had no idea if anything was happening or not. Saturday morning [January 19th and Elliot’s due date] I woke up a little before 2am with contractions. Our midwife told us if this happened [even if my water broke during the night] to go back to sleep. Well, I couldn’t really sleep, so I went upstairs to take a bath. I thought the bath would help… unfortunately it didn’t help at all. While I was in the bath, Dustin woke up to a “drip, drip, drip”… umm, yeah, the bathtub leaked through the ceiling [the new ceiling in the kitchen]. Very luckily the ceiling wasn’t damaged, but I was banned from taking baths. A little after 7 I finally told D that I thought I was in labor and maybe he should shower just in case. This ended up being a little premature, but, hey, I still had that 6 hour number in my head. We waited until after 8 to call Damaris [the best midwife ever] to let her know I was in labor. Our plan was to wait on going to the birth center… not leaving the house until contractions were 1 minute long and 3 minutes or less apart for an hour. The next few hours were pretty boring. Basically, I found out that I couldn’t eat anything… it would all come back up. I walked up and down the stairs a bajillion times and walked circles around the inside of the house. I wanted to go to the birth center, but Damaris said no. Turns out she knew what she was talking about. [= best midwife ever]. After HOURS of walking around the house, I was finally allowed to go to the birth center. We arrived around 4pm and I was 6cm dilated and fully effaced. This was good because Damaris didn’t send us home. That would have been bad. For me. At 6cm, I was hopeful that we would have Elliot on her due date. But, hours passed. I spent a lot of time in the tub at the birth center [a HUGE jetted tub, which was way nice]… a lot of time on the toilet [everyone told me the toilet was a good place for labor… they were right], annnnd some time walking laps around the birth center. Laying down was extremely painful, so Dustin and the best midwife ever made me do it. I also spent a good amount of time eating and throwing up. Dustin and Damaris made me eat [shot blocks, clif bars, chicken noodle soup, crackers, a Luna bar…] and then I would get sick. The strategy was that I would get some energy from this. Who knows. At some point I asked for Damaris to check and see if we were making progress. I have no idea what time this was, but it definitely seemed like we had already spent eternity at the birth center. 7cm. Dude. Not good. *Sidetrack here*. D and I took Bradley Method classes [okay, we technically dropped out several weeks before the end of class, but we got a diploma]. During class I said they were a waste of time and that we didn’t learn anything new. Not true. During class we learned that there is such a thing as a plateau… you can dilate very quickly or steadily to a point and then it seems to just stop… but not to worry because then all of a sudden you can quickly dilate a lot more. It’s just a temporary plateau. Remembering that is what honestly got me through the rest of labor and it was worth the $200 we spent on class just to learn that one thing. Elliot was not born on her due date. Obviously. The night continued to pass and we were very very close to being ready to push. I was pretty ready for this little activity to be over. I [by I, I mean Dustin] asked the best midwife ever if there was anything we could do to make this happen. She suggested a coffee enema. People, this is not something you want to do. Putting coffee in yourself in an unnatural way is seriously not fun. However, due to the fact that I needed energy and couldn’t eat or drink or otherwise obtain energy AND I had been in labor for a solid day, I went with it. And you know, maybe it worked. We moved to the bed and soon Elliot’s head was really coming out. D thinks it is really important that guys watch this… must have been cool. I know they could see her hair and apparently her coloring. Technically, this was pretty painful, but not really THAT bad because I knew it was almost over. 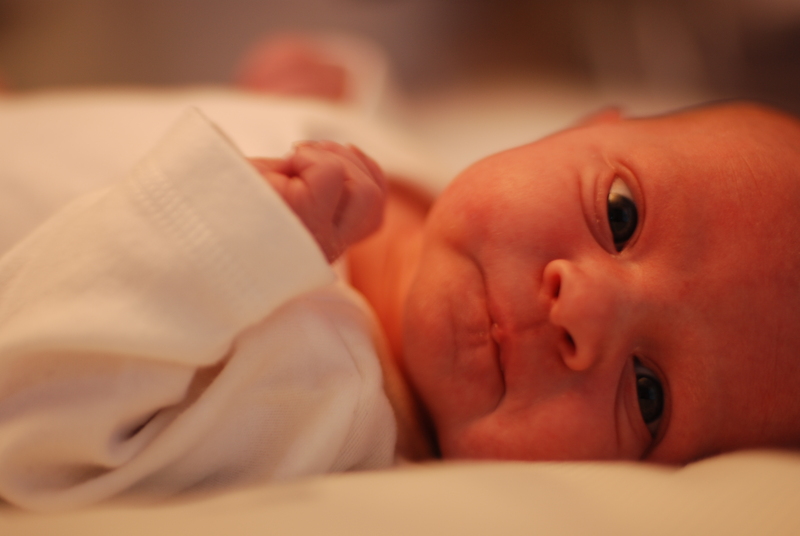 At 8:42am on Sunday, January 20, Elliot Anders Logan finally made her appearance into the world. She was kind of wiped off and came straight onto me. D cried. We waited for her cord to stop pulsating and D cut it. Then Elliot ate for the first time [she has barely stopped since]. At this point we waited for the placenta to come out… and we waited… and we waited. The best midwife ever started to get concerned, so I got a shot of pitocin in my leg [pitocin causes contractions]. I was also eating A LOT of random stuff, drinking coconut water, drinking ginger tea. The best midwife ever tried to REACH IN and pull the placenta out. No joke. Pretty painful. When she tried to pull the placenta out, it started to fall apart. There had been a LOT of blood at this point. Blood clots gushing out everywhere, best midwife ever scooping them into a bucket… seriously, it was like an episode of Dexter gone wrong. A LOT of blood. Alas, the assisting midwife called 911. Soon the ambulance arrived to take me away to CMC Pineville. The best midwife ever went with me [after changing out of her bloody clothes]. D had to stay with Elliot at the birth center so they could finish her newborn measurements. D cried… and this time it was pretty sad. The long and the short of it is, I went to the hospital. I was okay when I got to the hospital, and they started preparing me for surgery to remove the placenta. The nurse was the best nurse ever… D and Elliot arrived before I went into surgery and the nurse got permission for Elliot to be a visitor [the hospital has a rule against this right now because of the flu…]. Best midwife ever helped Elliot eat again. After a really long time, I was taken to pre-op. [The hospital moved ultra slow… I was still bleeding]. While in pre-op, I started to feel light headed and told the medical geniuses that I needed blood. They finally decided to rush me into the operating room where I passed out. I’m guessing I had a successful surgery following this… and got two units of blood. That pretty much sums up Elliot’s birth. Dustin, Elliot, and I spent the night in the hospital, but we were able to go home early on Monday morning. And we got to go home with this. It’s going to be my birthday soon[ish]. 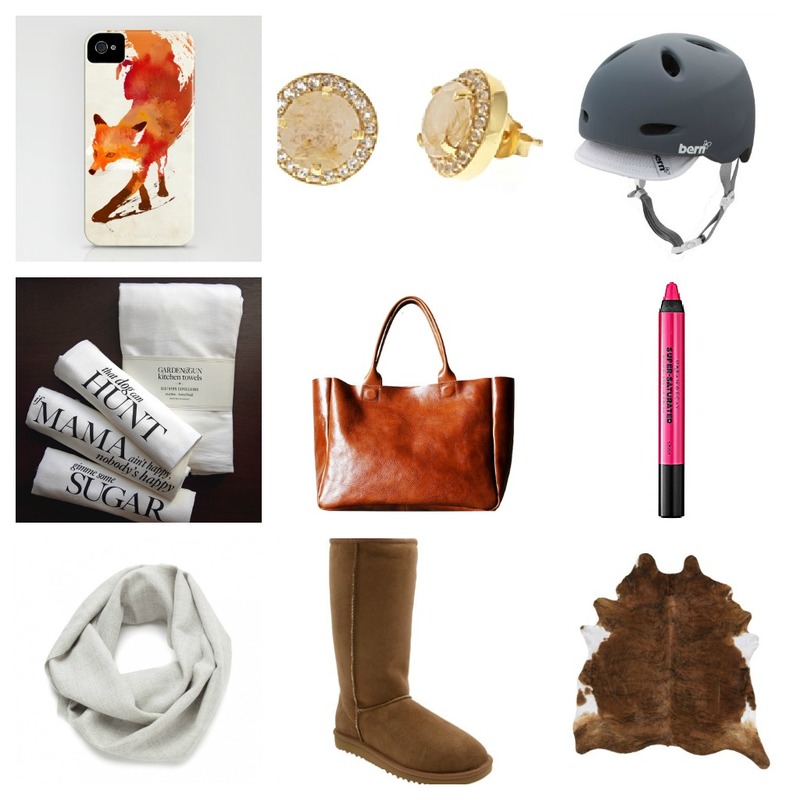 Luckily I maintain an extensive wish list year round [via wishpot.com] so I know exactly what to ask for. Oh, and two tickets to see the Avetts at Merlefest. Isn’t it interesting how having everything one color can make such an impact? 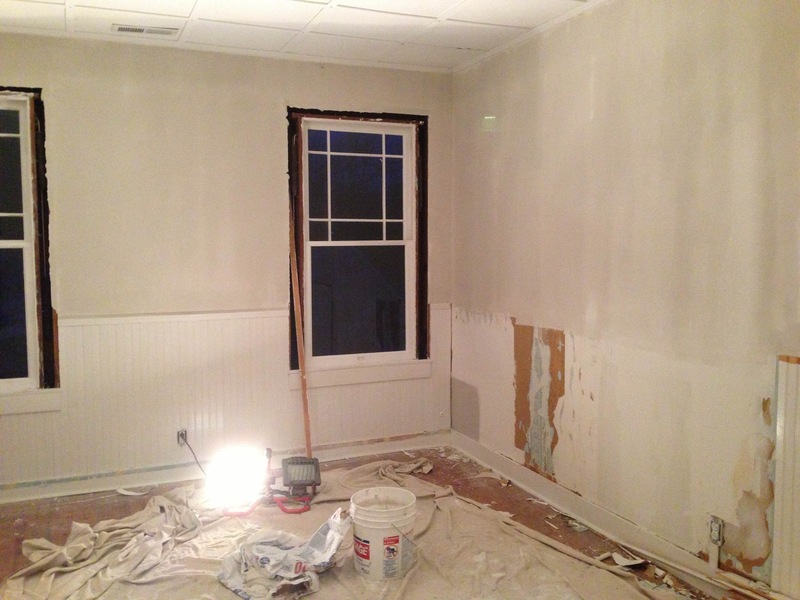 Umm, yes, the nursery looks better with just drywall mud. That’s a reflection of how bad it was to begin with. 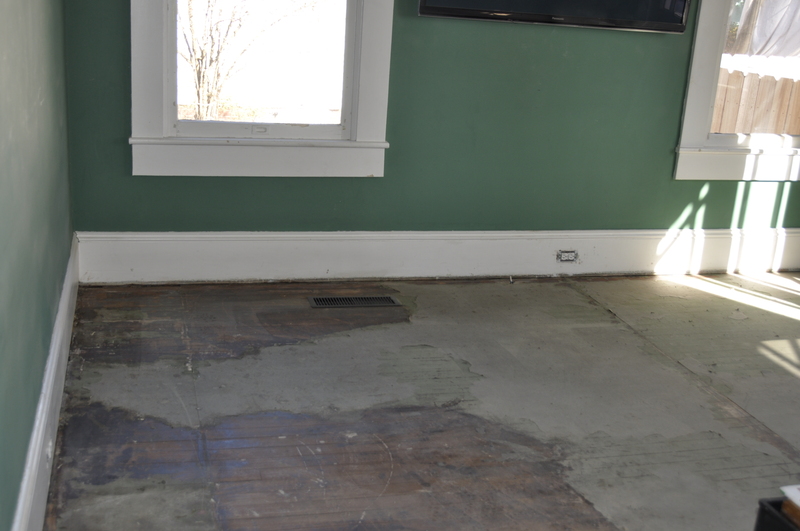 A few months ago [okay, back in April or so] D and I considered doing a complete kitchen renovation. The thing is, we found out how expensive it would be to create our dream kitchen, and we decided that we would rather make the kitchen nice and live-able but still have money left to do some other projects in the house that would also make a big impact [have the floors re-finished, paint, etc]. We still plan to totally re-do the kitchen eventually and we have the cabinet layout/floor plan so we are factoring that in now when we make decisions [how to place the electrical, NOT spending major $$$$ on a sink that will inevitably be replaced]. 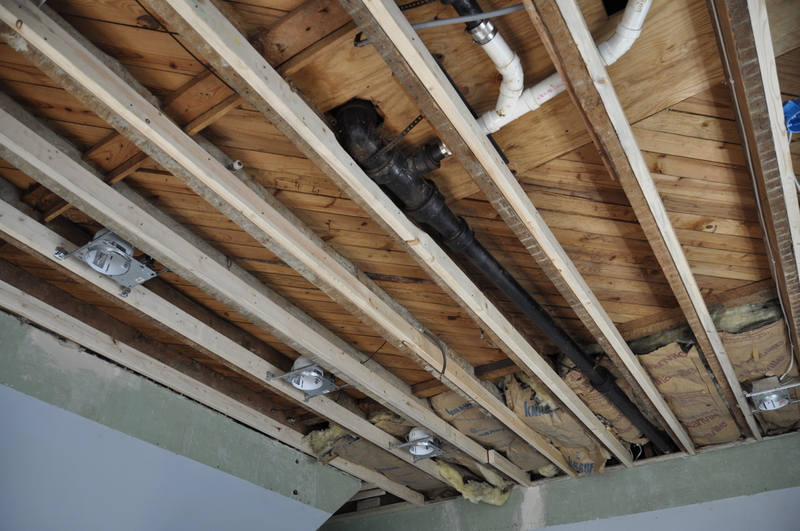 We removed the dropped ceiling and installed recessed lights plus two pendant lights above the sink area. The drywall guy finished up the ceiling on Saturday, so now it’s ready for paint. 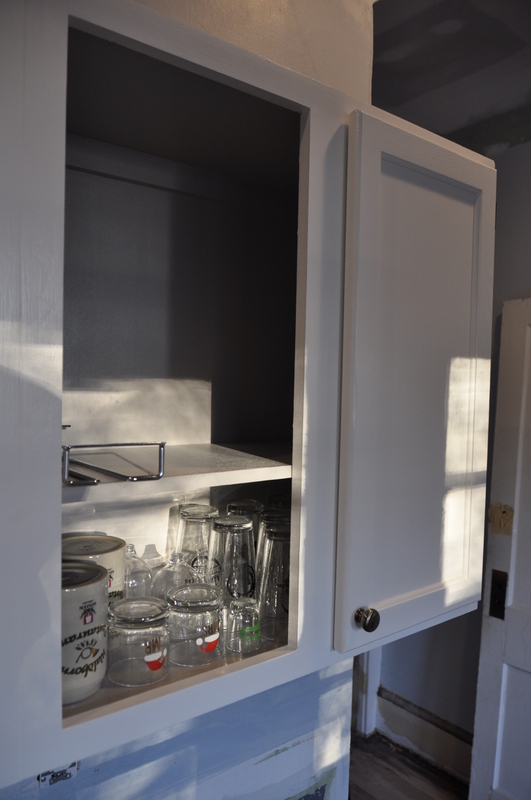 I decided that painting the cabinets and switching out the hardware would really help. 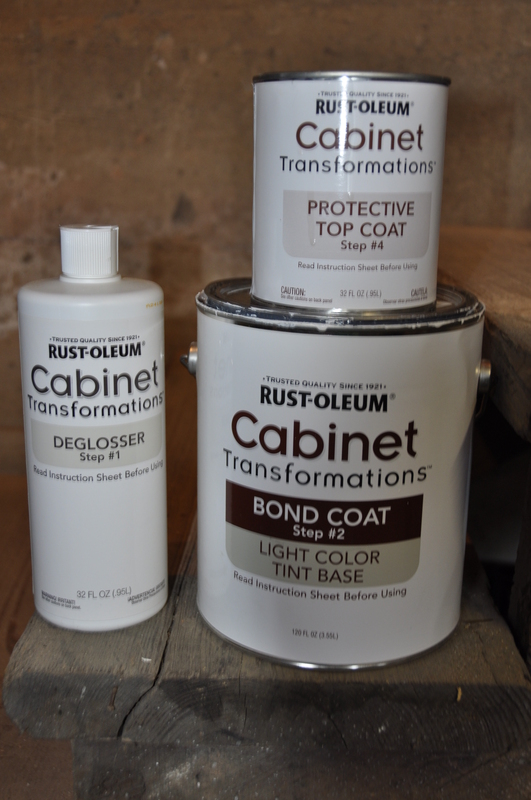 We bought the Rust-Oleum Cabinet Solutions system, which has been reallllllly nice. The kit comes with deglosser, paint [it requires two coats], glaze [I’m not using that], and a sealer. 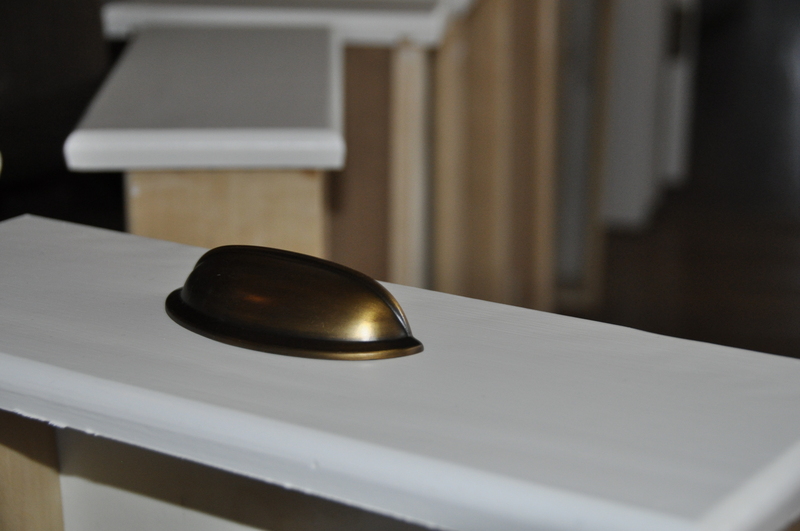 Rust-Oleum makes a light and a dark tint package – basically you pick the appropriate package based on the color you plan to paint the cabinets [Rust-Oleum lists the color options on the packaging] and have the paint desk at Lowe’s mix the color just like a regular can of paint. 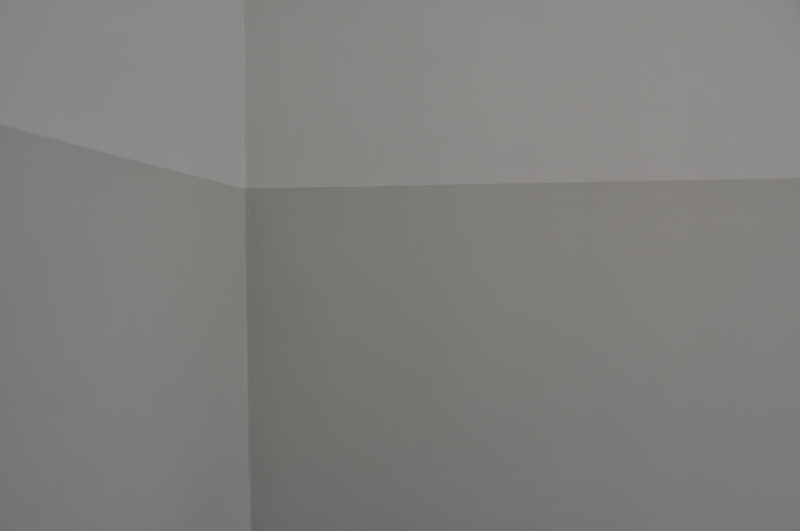 Because the insides had already been crapily painted [thank you people who owned this house previously], I was forced into painting those too, so I’m using a grey Valspar in high gloss. Anyway, the painters are coming at some point this week. They are painting the walls white. The floor guy is coming next week. 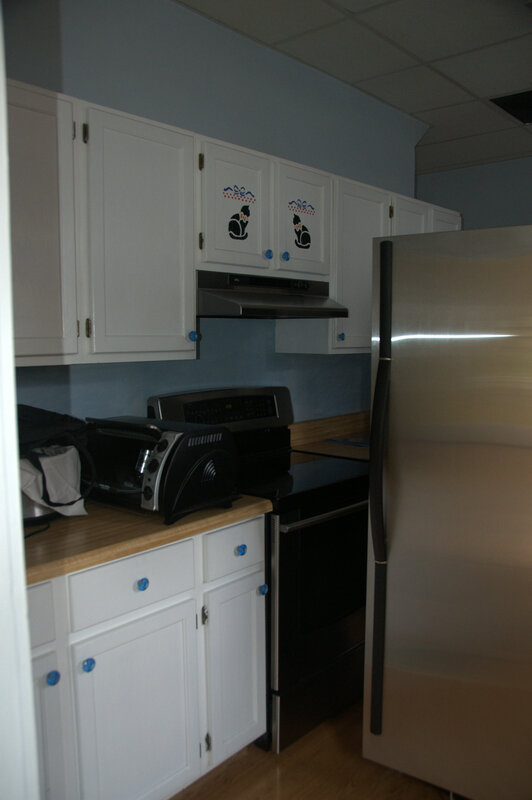 Then we can re-install the cabinetry and appliances. We’re getting a super inexpensive butcher block countertop from IKEA. 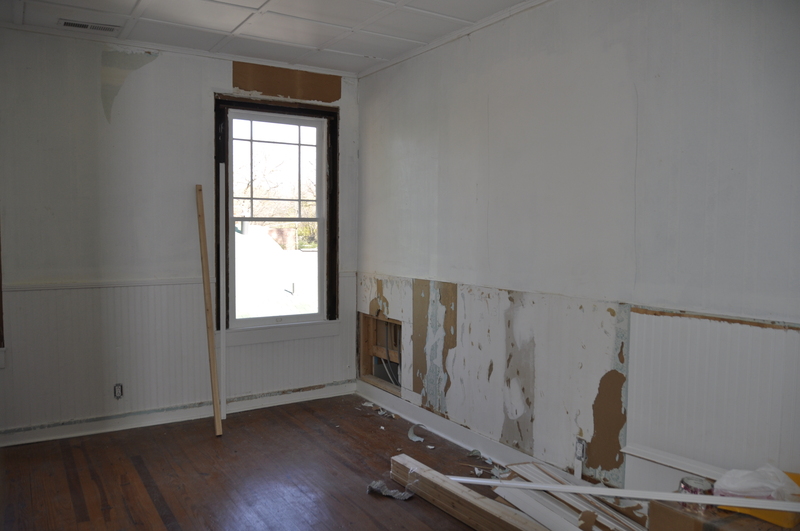 And D [or Ray, our contractor] is likely installing a beadboard backsplash. We ordered a sink [from Lowe’s, not to worry] and a new faucet [from ATG, owned by Lowe’s, still counts]. We’re planning to install a new gas range too, but not until after the holidays. We are also getting a new microwave for over the range, which I totally forgot about, until right now. So, I am a really bad blogger. I’ve been busy – working at my real job, traveling, being preg, and working on the house [that thing I’m supposed to be blogging about]. Plus Lily has been really needy. Yeah, lets’s blame her. 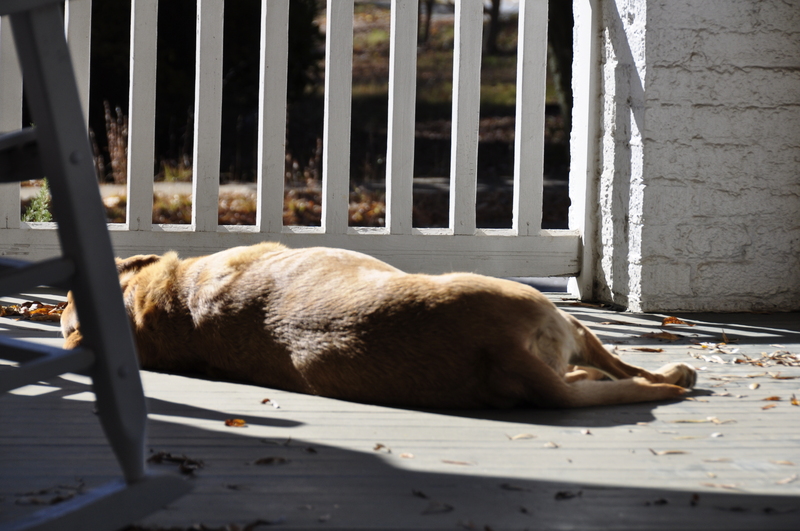 I took photos last weekend for a post… you know, the current state of the house. Unfortunately [or fortunately for me I guess], they aren’t really up to date anymore, so more to come. Here’s the bottom line: D and I are preparing for what I like to call “the trifecta”. Okay, obviously the last room [the nursery] needs more than paint. The truth is all three rooms [the kitchen, the back den, and the nursery] are getting the trifecta. D and I are also prepping our bedroom and the upstairs hallway for paint. Oh, and I painted the dining room recently. Kind of a teaser photo for two reasons. 1. 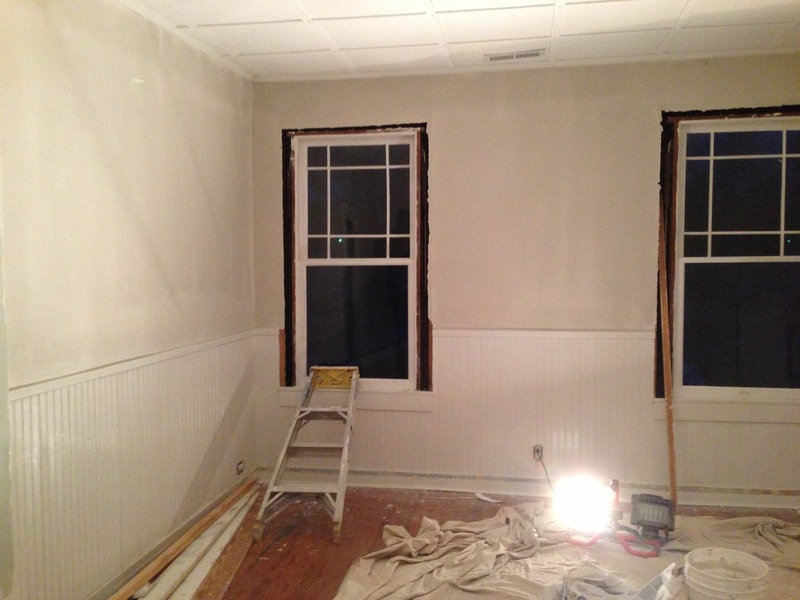 I cheated and the painters are going to paint the trim. I’m also in the middle of painting our kitchen cabinets with the help of someone I like to call, “Santa’s little helper”. Here she is in action. Yeah. So I don’t actually have a helper and that’s why this is taking so long. I love fashion, design, and all things baby [since having my daughter, Elliot]. My husband and I are slowly renovating our 1920s craftsman while balancing a life packed with running, traveling, and working full time jobs!